Put all of the ingredients in a blender and blend for 1-2 minutes. Use any combination of fruit you have: apples, pears, kiwi, grapefruit, banana, mango, blueberries, blackberries, apricots, cherries, melons. Dried fruit may also be added: raisins, currants, non-sulfur apricots, cherries, cranberries. Remove cores and inedible seeds. Put one cup of yoghurt in two bowls. Divide the fruit and nuts evenly. Toast the bread and spread with non-hydrogenated spread and sugar-free jam. Follow the package directions - but typically: Bring water, cereal and pinch of salt to a boil. Lower temperature and simmer for 4-5 minutes, stirring occasionally. Sweeten, top with fruit and rice milk. 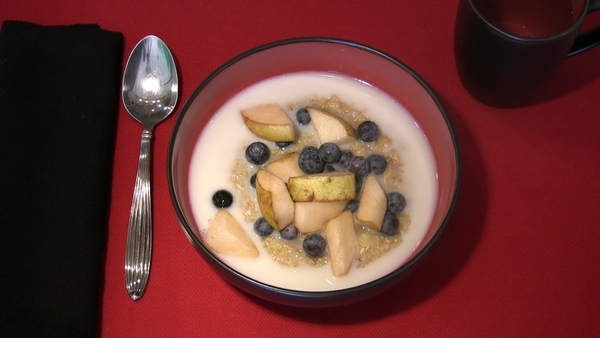 For one serving, put 1/2 cup of muesli in a bowl. Add berries and rice milk and serve with half a grapefruit. Toast can accompany all of these breakfasts. Use whole grain when possible. For gluten-free bread look for rice, corn, quinoa or millet. Top your toast with non-hydrogenated spread, almond butter, peanut butter, cashew butter, etc. and fruit sweetened jam or preserves.